This recipe is something i have been toying with for awhile…many ‘paleo’ baked goods use nut flours, which are delicious and easy to use, BUT leave out an entire population of people who cannot consume nuts (or choose not to). 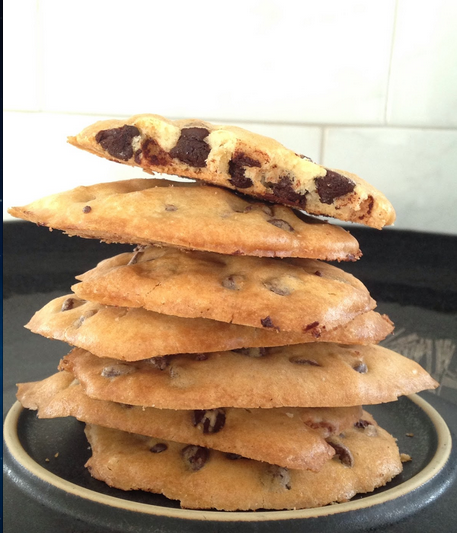 These cookies use a few different ingredients (some less paleo if you avoid potatoes) and create a thin, buttery, crispy chocolate chip cookie, with a slightly chewy center. If you prefer a thicker cookie, you can try these! I made these for my integrative doc who has a son diagnosed with autism who coincidentally has to avoid nuts. I am so grateful she was able to share these with him and when she emailed me his response afterwards, said he was beaming from his enjoyment. I am so glad to be able to share the “untouchable” treats with those who feel like they are missing out. It brings me a joy I cannot describe! Then incorporate flours until well incorporated – batter/dough consistency will be more like pancake batter. These are best served fresh out of the oven or by next day! Can something be subbed for the potato starch? Yes I have the same question can you use something instead of potato starch? Coconut, more arrow root., Tapioca, ?? I am not able to find the thicker cookie that you have a link to in the above sentences. It’s saying it has expired, . Can I get that from you? Very cool, I want to try these using gelatin for the eggs since my husband is allergic. He’s allergic to nuts and coconut too so with all those allergies, baked goods don’t happen unless we go outside the lines of Paleo and just use a GF flour mix that contains rice flour. which, honestly is not that big of a deal since it’s occasional (and he does Paleo plus rice anyway) but adapting this would be cool too! Hope he likes them! I do well with potato starch so I use it in some of my recipes!